Yet another month has passed by, and we’re closing in on summer! A total side track, but did you know that this week it actually snowed here in Sweden. Gaaah! It’s a good thing I have a trip to a warm and sunny Italy to look forward to in about a months time. 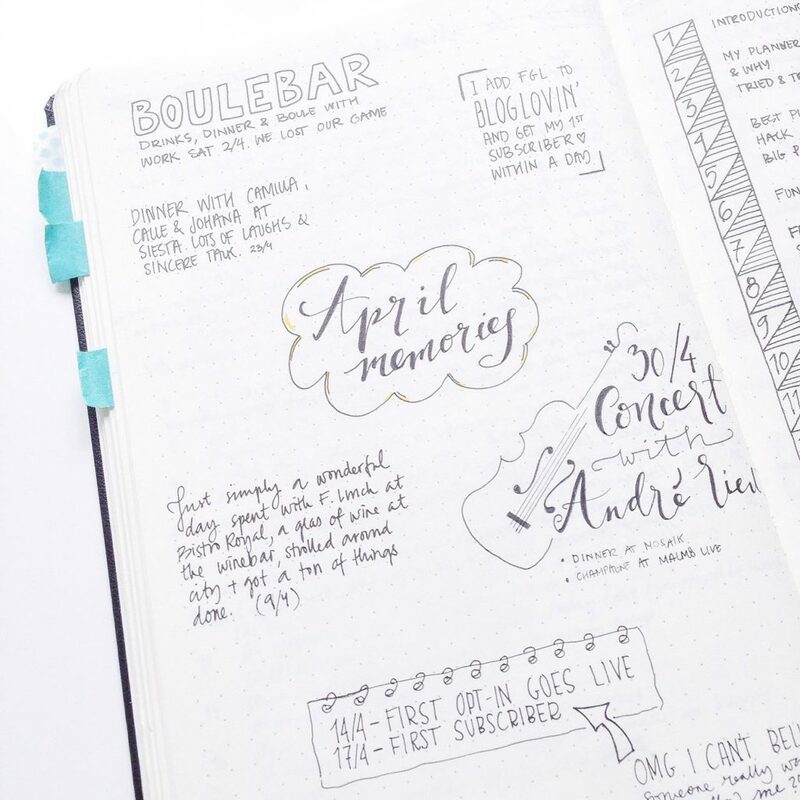 Hmm, now I’m totally deviating from what I wanted to chat about today :) I wanted to share my Bullet Journal (aka BuJo) setup for April – what I’ve done, what worked and what didn’t work. And I’ll also share what I’m doing for my May setup. 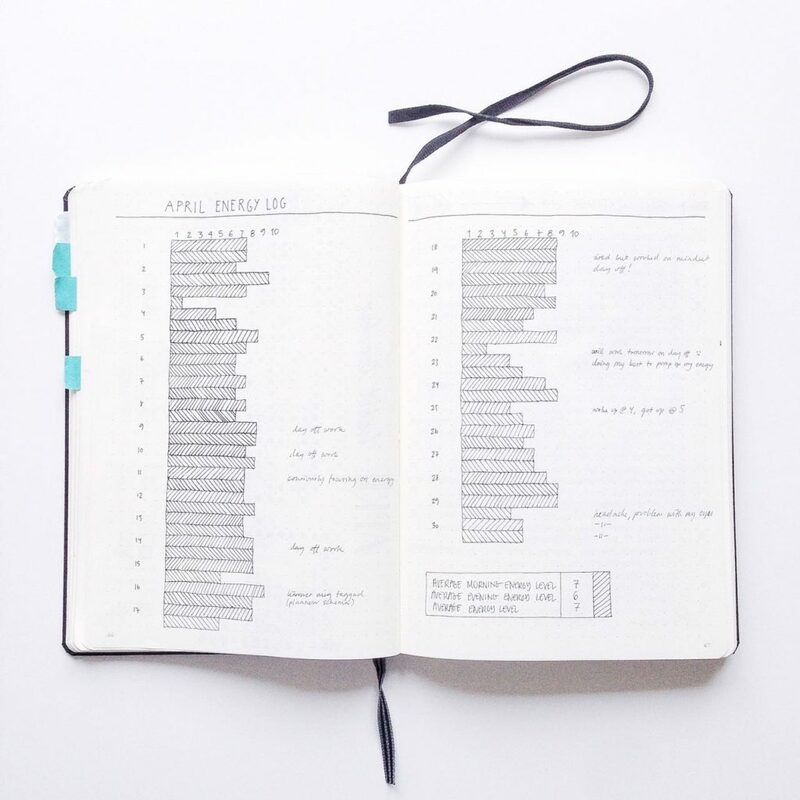 And as I wrote this all down I realized I’ve kind of been “upgrading” some commonly used bullet journal collections. Hope you’ll enjoy! I don’t know if you’ve noticed, but I always have my dailies on a spread. Meaning I won’t do a daily on one side of the spread and then a collection on the other side. Both sides on the spread are in fact dailies. The reason is that to me it makes the spreads more cohesive and I feel it brings a structure to my bullet journal that I really enjoy. Another thing that brings that structured feeling is the fact that I try really hard to always keep the same design and layout of my dailies that are on the same spread. 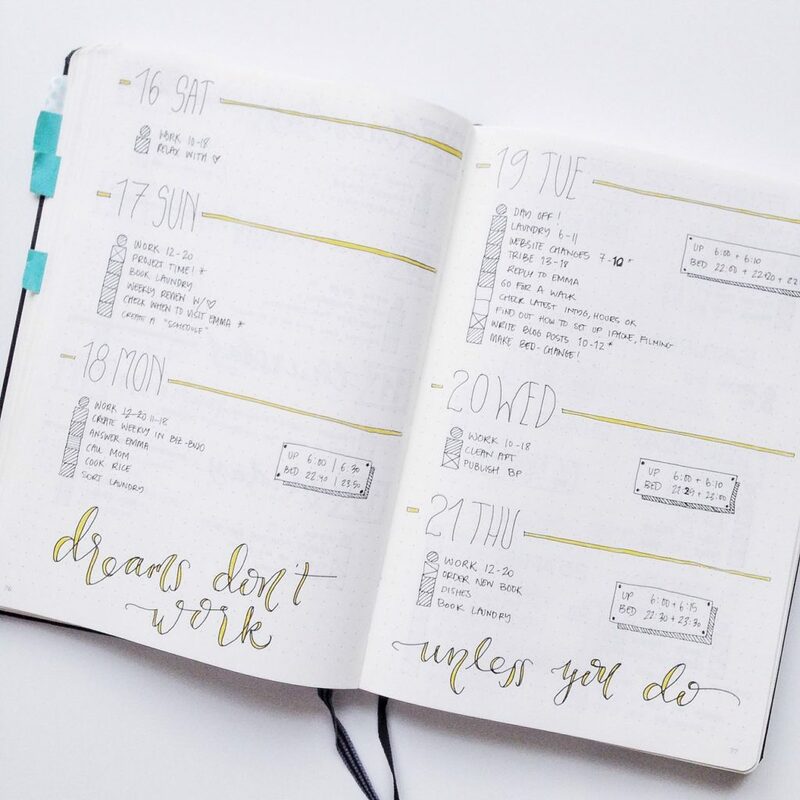 I love the fact that I can switch up my designs + layouts whenever I want to, I think it’s the O-N-E main reason I love the bullet journal so much. However, I took the decision to not be ’all creative’ with dailies that are on the same spread. So. Dailies that are on the same spread will have the same layout and design. End of story. 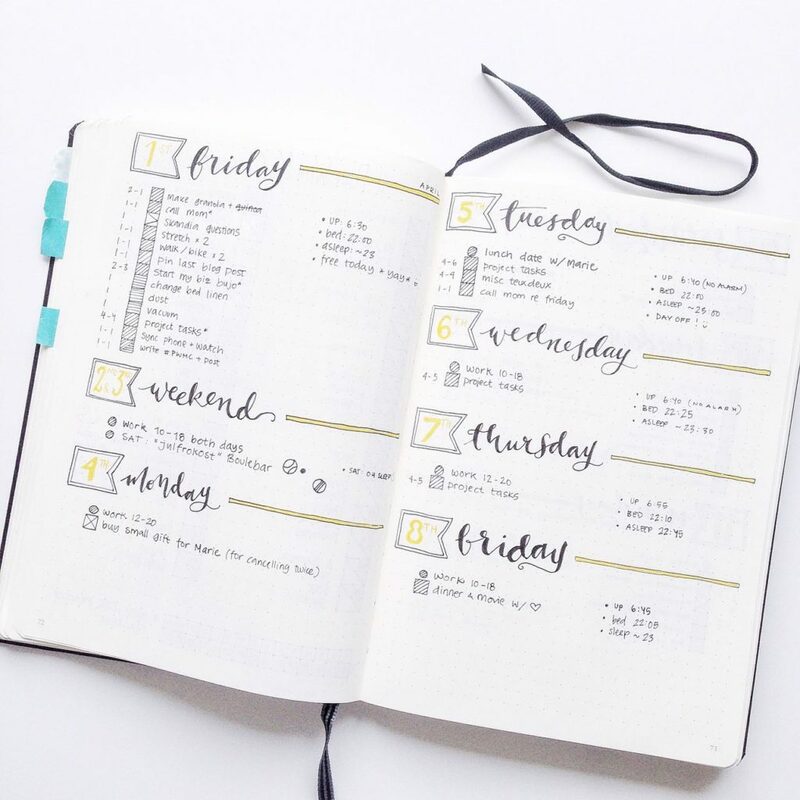 Having the dailies on one spread has proven to work great for me as I don’t feel the need to migrate tasks from one day to the next as long as my next day will be on the same spread. Hm, does that make sense? It just means that if I on the first day in the Daily don’t get to complete all of my tasks, I just leave them unmarked and I write out my next day. Of course I don’t have to write those task on the next day as I can see it on the day before. However, if it is a task that’s really important or for some reason I just want to migrate it, then of course I do. Once I get to complete the task I simply mark it off as completed. To complicate it a bit further ;) Tasks that I complete the day I had planned to, those I mark with slanted lines through the box. As an example you can look at “grocery shopping” on Thursday’s list of tasks. I wanted to do it on Thursday, and I did it that day as planned. Tasks that I complete on another day I mark with horizontal lines, as you can see the task “setup May collections” on Tuesday. There’s no need per se to differentiate the two, I just like to do it. Ok, so for April I decided to have my Goal collection on the same spread as the Habit Tracker. That way I would see it more often and hopefully keep my goals top of mind. Honestly I’m not sure it made a difference. I think I looked at the my goals just as often as in February. Obviously not what I had hoped for but I’m not giving up! 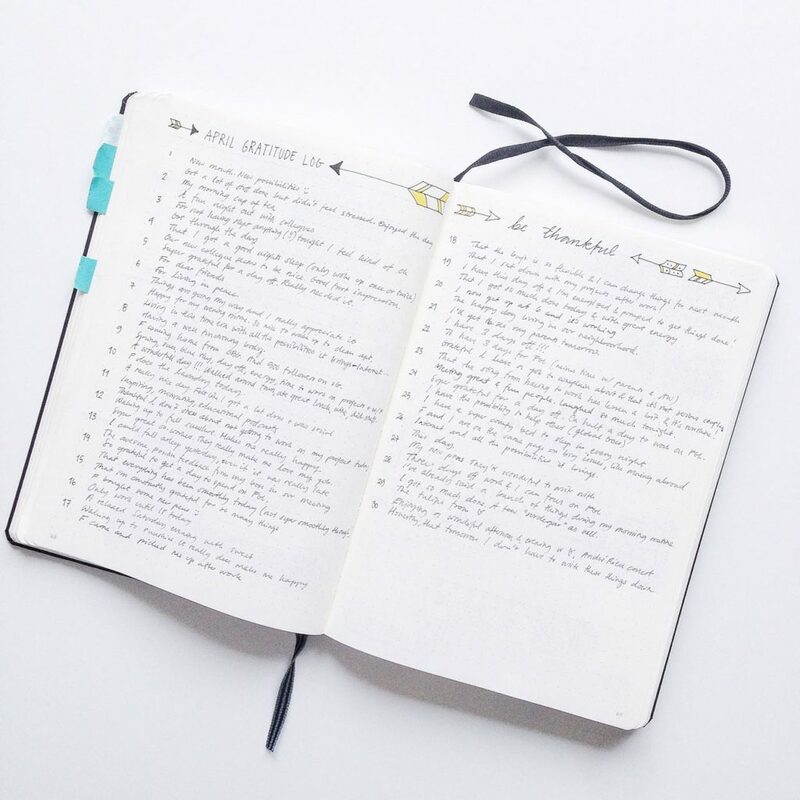 For May I will actually add it to my morning ritual to read my goals before I do anything else in my bullet journal. Some of my goals are not a one-time-occurrence but rather something I want to do each and every day. Take for example the goal to clean our windows. That’s something I’ll do once then it’s done. 100% completed. Awesome. But then there are goals that I really want to do on a daily basis, for example to meditate. Although I would love to do it every single day, I most likely will fail some days. That means I won’t be able to mark that goal off as completed, even if I did it 99% of the month. And I love the feeling of being able to check something as completed. It’s done. Success! So I’ve decided to add a percentage into the mix! For each goal I will calculate how many per cent I succeeded. For the window cleaning example, it will be 100% if completed and 0% if not completed. 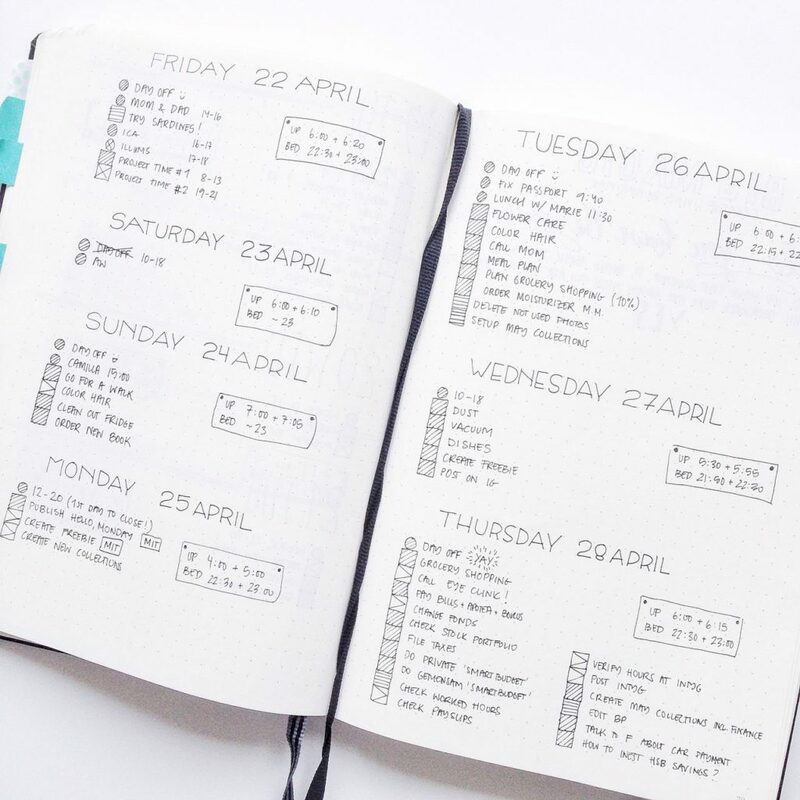 As for the other situations, where I for example want to do something daily, I will have to check my Habit Tracker or do an estimate of how often I think I’ve done it. So, I’ll add up how many days I did do it, then I’ll divide that up by the number of days that month to get the percentage. I’m not sure if the reasoning is super clear on why I think this will help me with my motivation, so I’ll try to explain. This is mostly applicable for the goals that I want to do daily, e.g. meditate. If I don’t have this system, then it just takes one day where I don’t e.g. meditate, and I won’t be able to mark that goal off as completed even if I do it all the other days that month. And then I know I’ll never be able to check that goal off as completed and I feel a bit frustrated-ish and a small piece of me kind of looses the motivation to keep up. 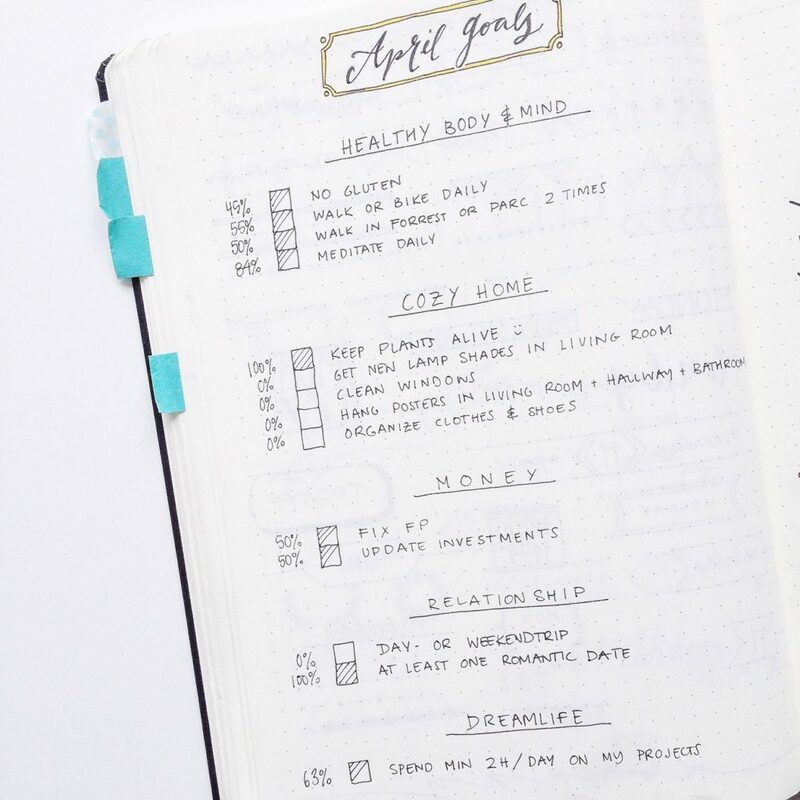 Of course I don’t live just to mark off goals as completed, and I’ve set my goals because I think they are important and I do mostly keep my motivation to continue doing them throughout the month. But by knowing I have the possibility to reach 99%, instead of maybe just e.g. 50%, that helps me to stay on track the days that are left that month. Because I want to get as high of a percentage as I possibly can. Another thing I decided to do in May is to add action steps to my goals. Let’s take a goal from April that will be migrated into the May Goals as an example. For ages Fredrik and I have talked about that we want to personalize our home, and one way to do that is by hanging up some posters. This month was the month we were gonna make it happen! Or at least that’s what I thought at the beginning of the month. The thing is, we want to create and print those posters ourselves. Fredrik is an awesome photographer and has some pretty amazing photographs we’d want to use. And I’ve been thinking I wanted to create some handwritten quotes, some watercolor paintings or whip up something in Adobe Illustrator. That was a bit different than just ’hang posters’, right. Now I’ll see how many tasks are involved and although some will be rather quick to complete, others will take up a lot of time and mental energy. And that’s something that’s great to know when I plan out the goals for the month so I don’t overdo it. I really like the Habit Tracker. It’s like gamifying what’s important! Plus it’s a great way to get an overview of how I’m doing. I will keep the same habits next month and I will probably add a handwriting challenge to it as well. If you have any tips for awesome challenges on handwriting I’d love to know! For May I’ve added a percentage column just after the last day of May. There I’ll write my percentage of how well I did. Similar to the Goals collection I will add up how many days I did the ’habit’, then divide that by the amount of days of that month to get the percentage. When I set up my April Habit Tracker I didn’t know I’d want to add the percentage info so there really wasn’t any great place to put it. But I squeezed it in before the actual description of the task as you can see on the photo. I really, really like this idea of calculating percentages – it helps me understand how well (or poorly) I did on the different tasks! Another thing I’ll do for May is to make a note on what I mean by ’morning routine’ and ’evening routine’. 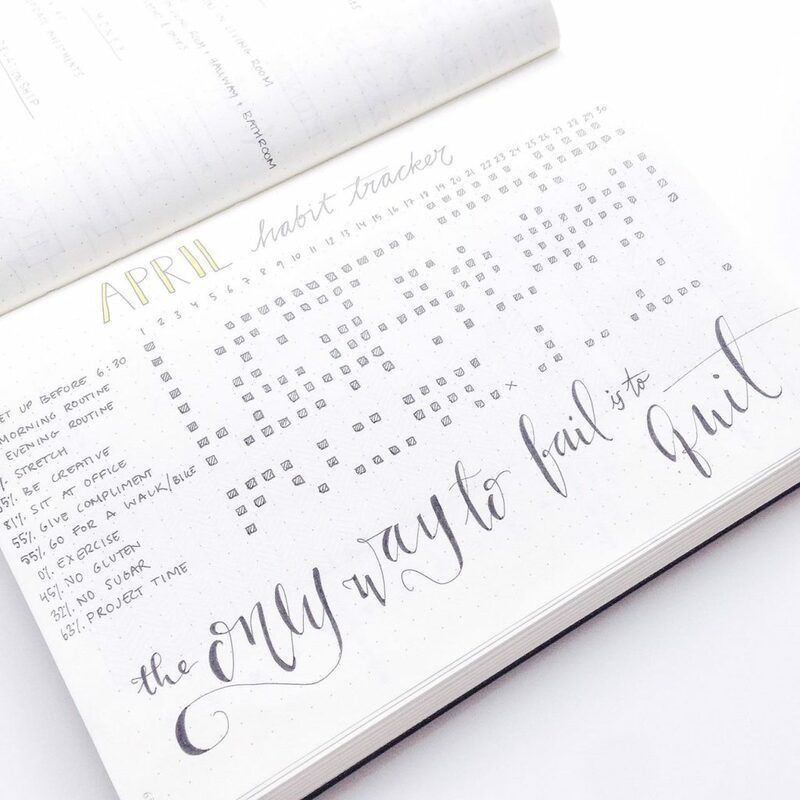 Either a note on the Habit Tracker page or I’ll create a specific collection for it. But either way it’ll take less brain power to keep track of the different areas I want to include in those rituals if I can refer to it somewhere. In my Energy Log I keep track of my energy levels in the morning and evening. I rate it from 1 to 10, where 1 is the lowest and 10 is the highest. If I hit 8 I’m happy, that’s where I want to be as a minimum. At the end of the month I’ll be calculating the averages – morning, evening and total energy levels. 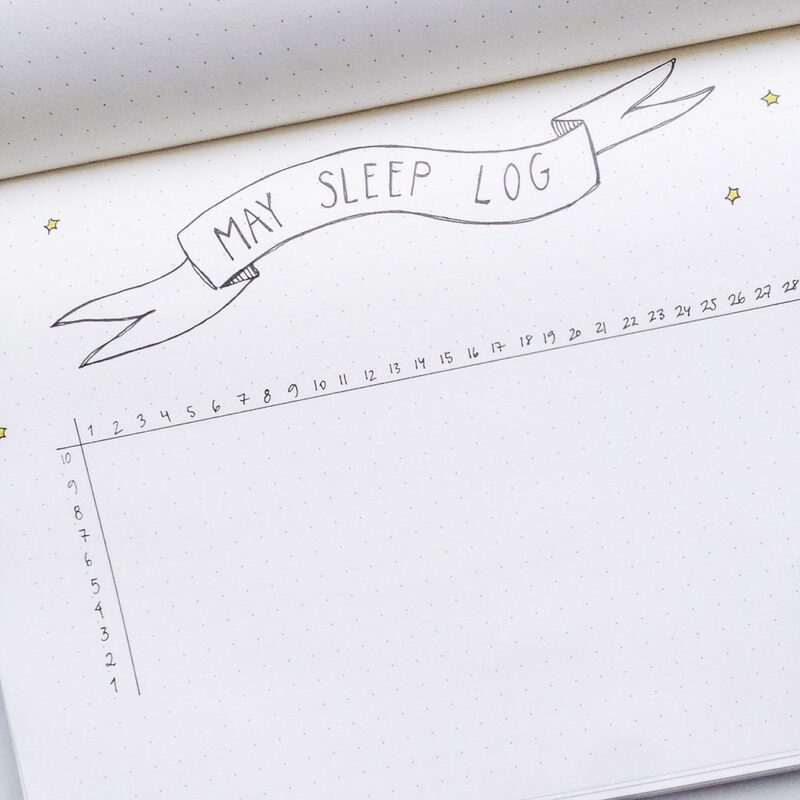 I think it’s really interesting to see the energy levels throughout the days, especially since I started to jot down some short comments about what has happened that affected my energy levels. It’ll be super interesting to compare the average energy levels from month to month going forward! In this log I write down things I’m grateful for, big or small. 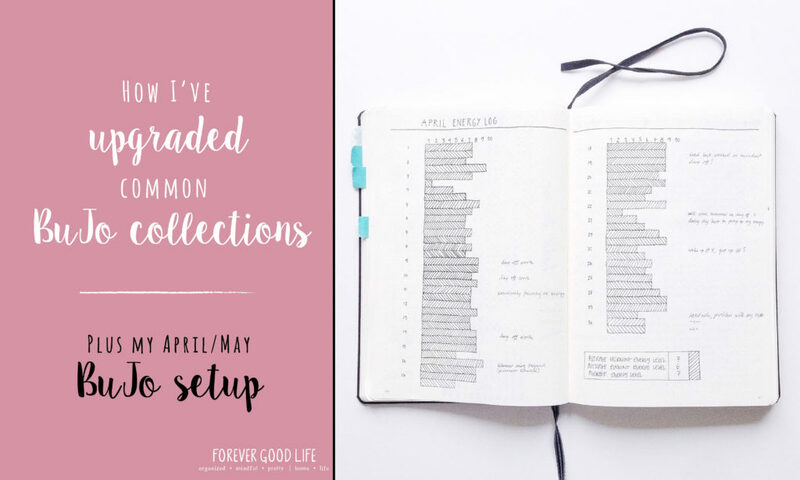 I started out by writing two things in the morning (in February), then I messed up my Gratitude Log in March (you can read about that here) and so instead I started writing one thing I was grateful for in the morning and one in the evening. And I stuck to that routine in April. This is the only collection I won’t continue with in May. At least not in this format. To me it comes really natural to be grateful for both the small and big things in life, it’s something I’ve done since I was a kid. And the act of writing only one (or a few) down kind of stifles me. At least it feels that way at this moment in time. I know that research shows it’s way better to write down what you’re grateful for than to think them. But in May I’m going to skip the writing part. I’m simply going to spend a few minutes thinking about what I’m grateful for as part of my morning routine. I L O V E the Memories collection. Whoever came up with the idea, thank you! :) It’s so much fun to be able to go back and get an overview of the big happenings that month. This is a definite keeper for the May setup. This collection is great to quickly be able to see what the days challenge prompt is + it gamifies it. I just love being able to check something off as completed. 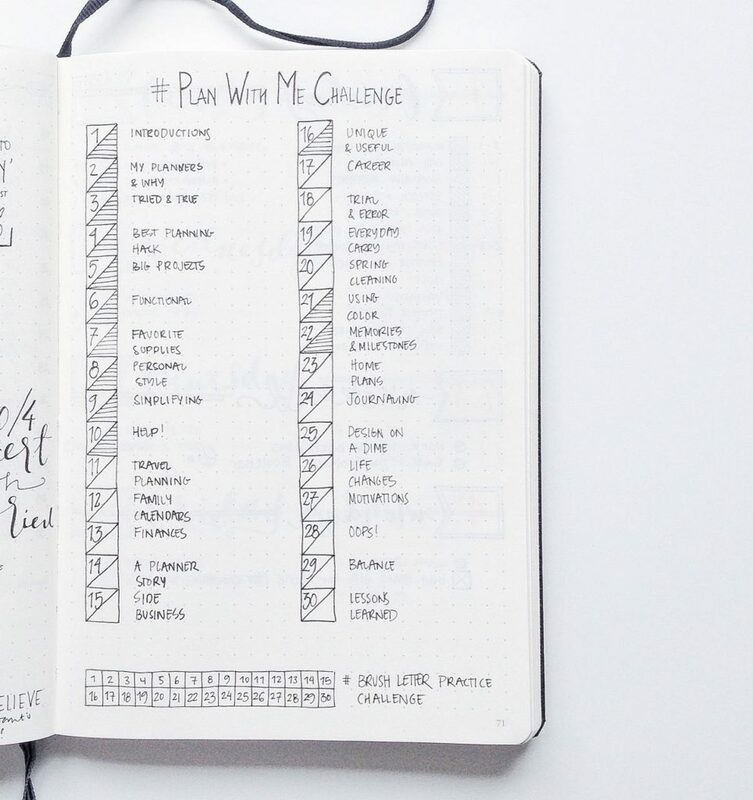 I haven’t decided if I’m going to keep up with the #PlanWithMeChallenge in May. I love to see what everyone else posts, but I’m quite bad at keeping up with it. I do know I’ll want to add another challenge though, something related to handwriting. If you have any tips on great challenges on that topic, I’d love to know! 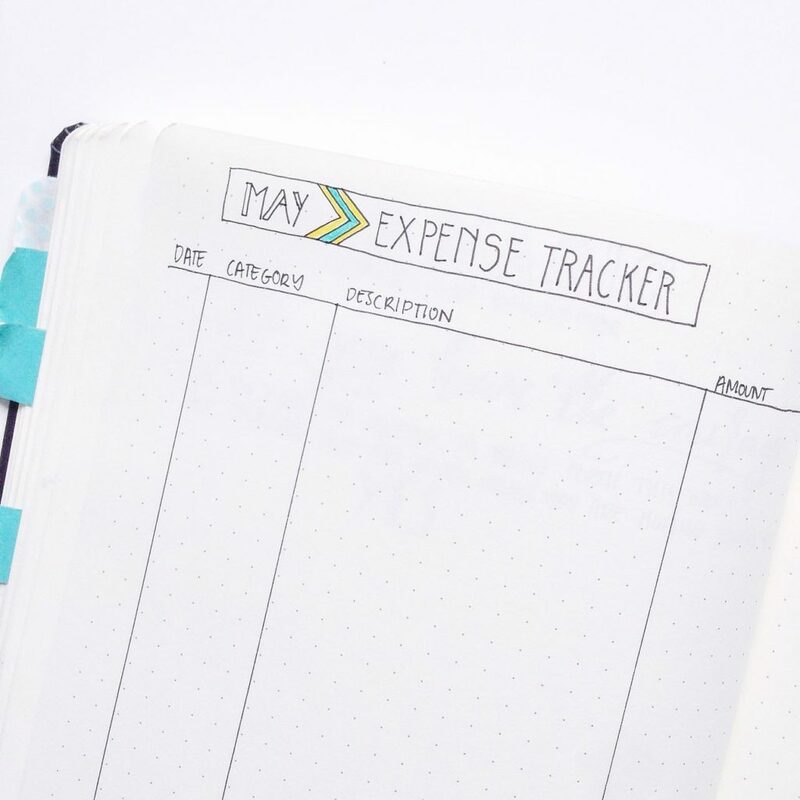 First off we have the expense tracker! I know so many of you guys already use this and I can’t wait to get going with it! I think it’ll help me really ”get” where it is I spend my money and it’ll work as a support to my digital budget software tool. My other newbie is a Sleep Log. For a really long time I’ve been writing down when I go to bed, when I (think I) fall asleep, when I wake and when I get out of bed. And it’s been great to notice when I’ve been going to bed too late and so on. But now I’m stepping it up a notch with this Sleep Log. Here I’ll create a diagram of my sleep hours to make it super easy to see if I’m getting enough sleep. Thank you Eva. 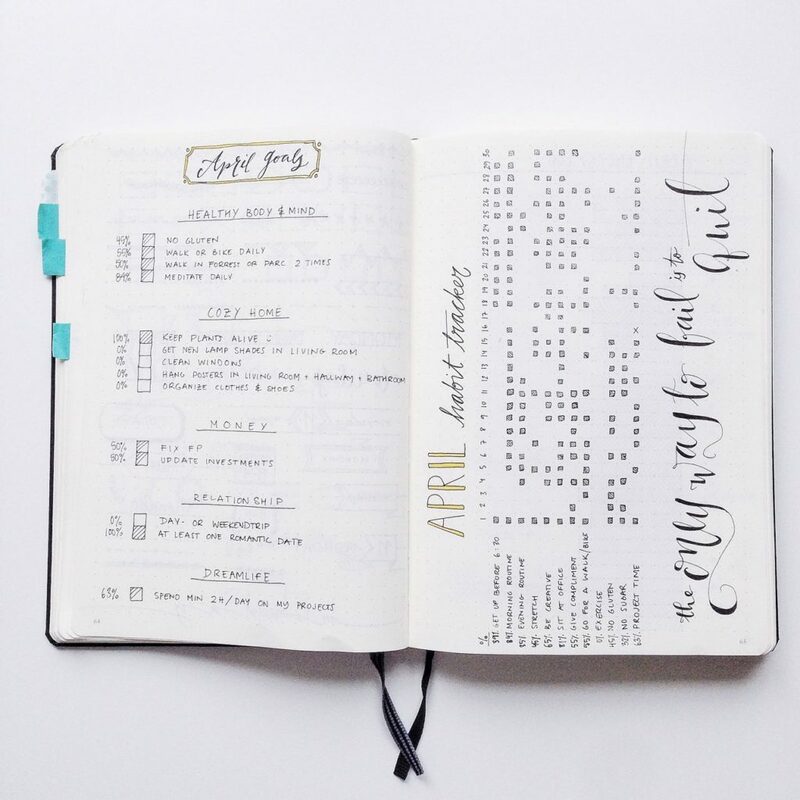 This was great inspiration for my new bullet journal.